Around noon on Friday I arrived at Waterwise Botanicals in Bonsall, in what they call North County (the northern part of San Diego County). I've been to all the Succulent Extravaganzas at Succulent Gardens in Castroville, but Waterwise's Succulent Celebration was even bigger. For starters, the nursery is significantly larger, around 20 acres. That's a lot of space! 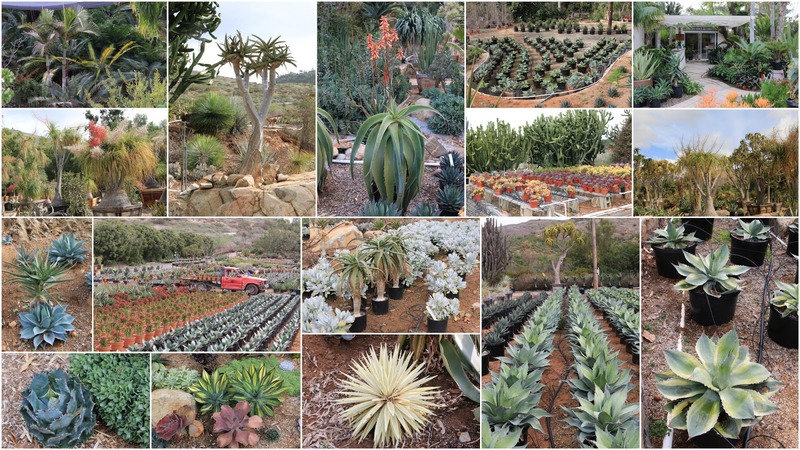 Waterwise has entire hillsides devoted to growing succulents. I have a lot of photos to share with you. 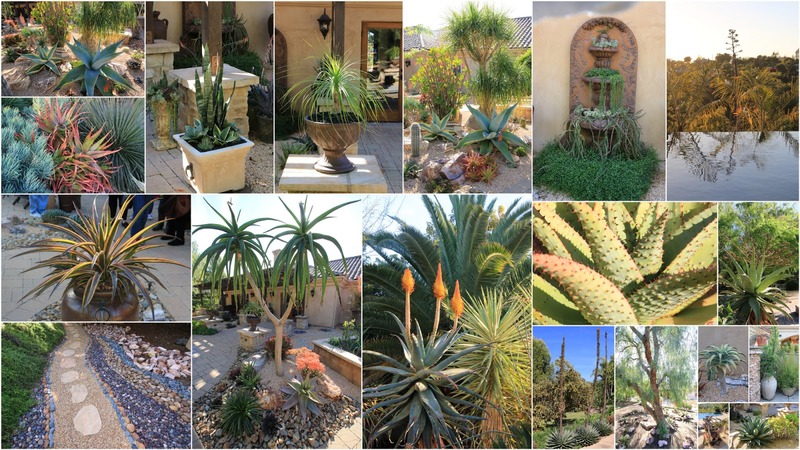 In the late afternoon on Friday, our Succulent Fanatics group was invited to the home of Jeanne Meadows. 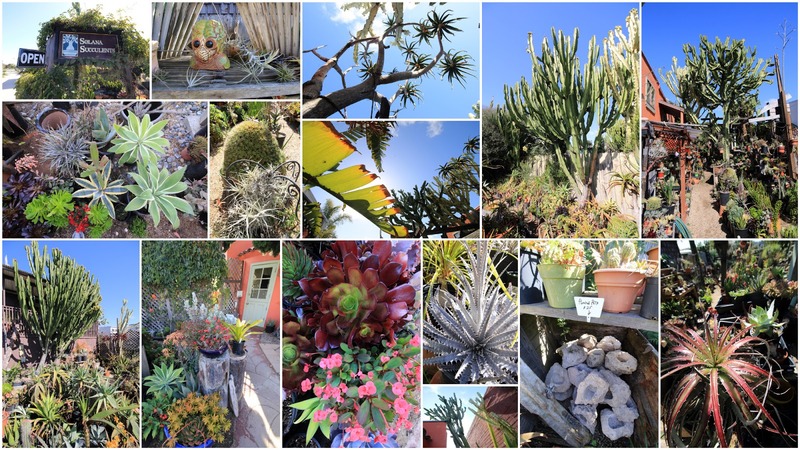 Jeanne's garden is a succulent lover's paradise. Pristine specimens in an impeccably designed space in a serene spot in the country. I didn't want to leave! 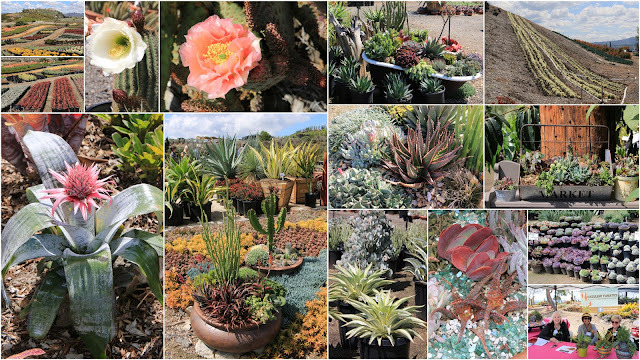 On Saturday morning, my friends Deana and Sarah and I drove to Rancho Soledad Nursery in bucolic Rancho Santa Fe. Most of their business is wholesale, but they do sell to the public. 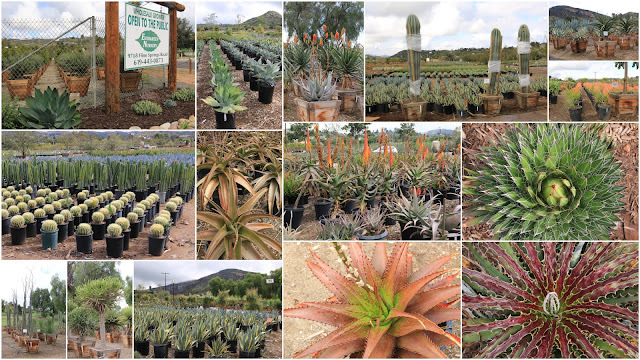 Rancho Soledad is the place to go if you want a 20-foot tree aloe, or a 30-feet palm tree. Their tissue culture operation, Rancho Tissue Technologies, has been on the cutting edge for many years and has brought us popular plants like Agave 'Blue Glow', Agave 'Blue Flame', Agave 'Blue Emperor', Agave bracteosa 'Monterrey Frost' and many others. We were free to wander all over their 25-acre nursery grounds. The experience was as exhilarating as it was exhausting. There is almost too much to see! After saying goodbye to my peeps at the Succulent Celebration, I headed to Carlsbad, about 40 minutes away on the coast. 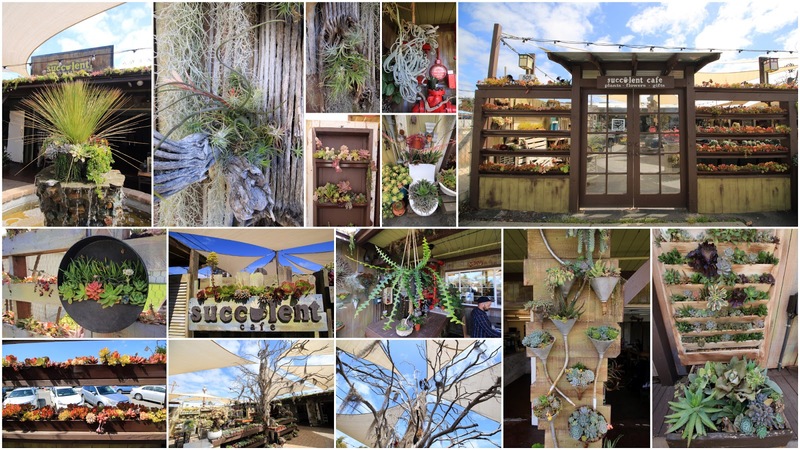 My destination: the Succulent Cafe. This is one of those places you keep hearing about for years but never get a chance to see. Well, now I did. The concept is simple but cool: combine a comfy place to eat with a store that sells, well, succulents. And air plants. And gifts, containers, and all manner of accessories. It's not a huge space, but an hour flies by quickly. My final stop was at Solana Succulents in Solana Beach, one of those laid back California beach towns you think only exist in movies. I'd met owner Jeff Moore on three different occasions in the last month, and I was looking forward to seeing his nursery. Jeff has been in this spot for 25 years, and he has accumulated many treasures. I thoroughly enjoyed visiting Evergreen, Waterwise Botanicals and Rancho Soledad, but Solana Succulents is the kind of nursery I live for: a place run by a plant nerd for other plant nerds. It reminded me a lot of Peacock Horticultural Nursery in our neck of the woods, except it's all succulents. I could have spent half a day there exploring all the nooks and crannies. I will definitely be back—with my own car. So glad you made this trip and will be reporting back on your travels -- what a road warrior! Now that is a whirlwind trip! How in heck did you get that 5-gallon Aloe (and whatever else you couldn't leave behind) home on a plane? Did you have to buy it its own seat? You and I and Denise were all at Waterwise Botanicals within a week or so of each other -all inaugural visits too! What a great place ! I had evergreen on my list but I ran out of time, and Solana Succulents was closed on the day I did my SD nursery crawl so I didn't get to go there either. Looking forward to the future posts. Squeee! Can’t wait for the in-depth coverage, what a fun 48 hours! Inspiring trip. I just drove down to Waterwise this weekend for the celebration and went to a set of nurseries in Fallbrook - came back with a van full of plants. Now I see that I need to go back and explore more broadly! Those collages are a great teaser. Can't wait to see more. The really crazy part is that you didn't have a vehicle with you to transport some of these marvels home with you.